The table’s features make it easier for the sonographer to access the patient from all sides. The cardiac scanning cushion drops down and releases from either side of the table with nothing protruding. The sonographer has open access to the left thorax area for an unobstructed apical approach. 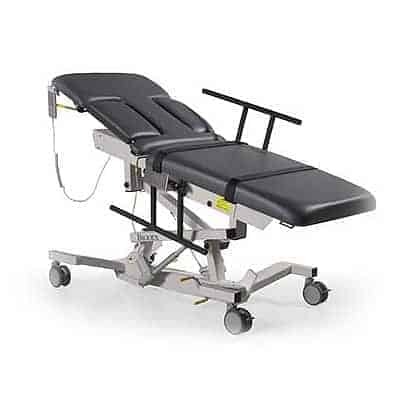 Side rails mount flush to the table and fold completely beneath the table out of the sonographer’s way, eliminating potential obstruction. Patient comfort is assured even during lengthy procedures with our Naugahyde® antimicrobial mattress cover, which also provides protection against bacteria.